There it is. That’s what we I know. Well, that and also this. I’m cheery to call it a Hearthstone clone because, well… With the five hero thing and multiple boards and all that – maybe Artifact is chasing Hearthstone’s vein, but it reads like it will be a different kind of trip. I feel like that’s somewhat key to the whole ‘Valve is just going for the money’ sentiment I’m seeing around Artifact’s announcement. 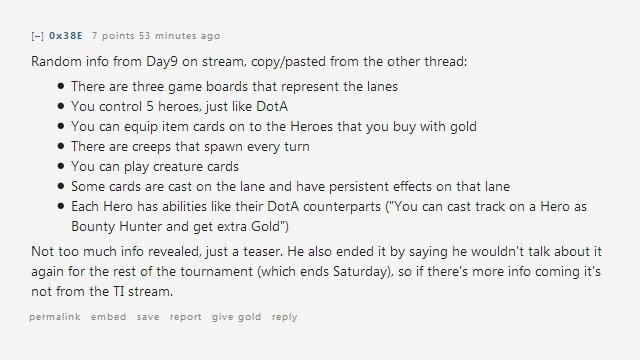 If this is about chasing the card-game trend, that means those individuals within Valve are giving that chase, not necessarily Valve as an organisation. Naturally I hope that’s not the case for those people, because I figure a much better game will come out of a project that those people genuinely want to work on. I’m not especially excited, but Valve being the snowflake it is I do find myself curious and interested.